As you probably already figured out, I am working on software that can find device location by closest Wifi Access Points or Mobile Base stations, as number of access points or base stations might change, I need an algorithm that can adapt to uncertain amount of points. There are some similar questions here and here, but none of them exactly answers to my question. The radius measurements surely are subject to some error. I would expect the amount of error to be proportional to the radii themselves. Let us assume the measurements are otherwise unbiased. A reasonable solution then uses weighted nonlinear least squares fitting, with weights inversely proportional to the squared radii. One advantage of using a statistical technique like this is that it can produce confidence intervals for the parameters (which are the coordinates of the device) and even a simultaneous confidence ellipse for the device location. The white dots are the (known) access point locations. The large blue dot is the true device location. The gray circles represent the measured radii. Ideally, they would all intersect at the true device location--but obviously they do not, due to measurement error. The large red dot is the estimated device location. The red ellipse demarcates a 95% confidence region for the device location. The shape of the ellipse in this case is of interest: the locational uncertainty is greatest along a NW-SE line. Here, the distances to three access points (to the NE and SW) barely change and there is a trade-off in errors between the distances to the two other access points (to the north and southeast). When the radii are measured without error, all the circles will have at least one point of mutual intersection and--if that point is unique--it will be the unique solution. This method works with two or more access points. Three or more are needed to obtain confidence intervals. When only two are available, it finds one of the points of intersection (if they exist); otherwise, it selects an appropriate location between the two access points. First determine all n*(n-1) intersection points. Call the set of these intersection point I. Take a list of points T which contains the innermost points. Then for each point p in I, check if p is inside every circle. If p is inside every circle, then this is point on the innermost intersection. Add such a point to the list T.
Just calculate the centroid (use distance as weight?) of the polygon formed by T and centroid is the desired location. Calculate the minimum circle that contains every point of T. Then the center of this circle is the desired location. Calculating R should be straightforward after this. Another note: first convert signal strength to distance using free space path model (or variations). My take is: you have any training dataset, you should try to find path loss exponent using some learning technique instead of using n=2 or n=2.2 as fixed value. Not the answer you're looking for? Browse other questions tagged mobile geolocation overlapping-features or ask your own question. 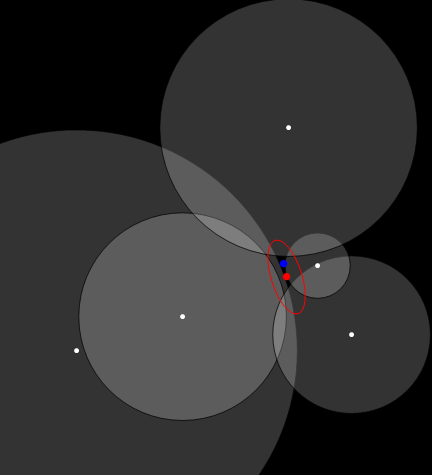 Trilateration algorithm for n amount of points in R? Geo IP database for Brazil? Splitting overlapping points with same symbology in ArcGIS for Desktop? Mobile “GIS”/geolocalization application for popularisation of science?